Maropost is one of the first companies to launch lead ads integration and are excited about the opportunities it brings to Maropost customers. 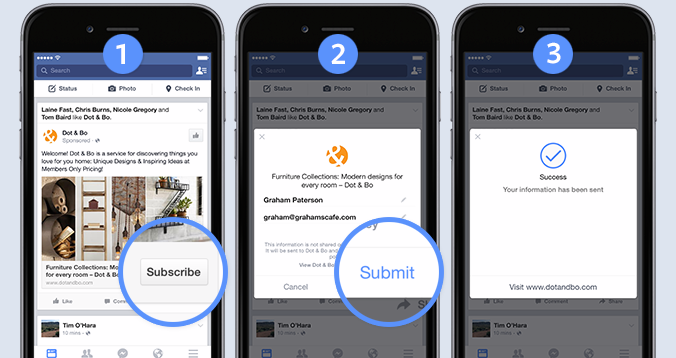 With Facebook Lead Ads a marketer can use a standard News Feed ad, clicking the call to action launches a native lead form on Facebook. The form prefills data like Name and Email to save time (the user can edit these fields before submitting). Increasing conversion rates, and expected cost per lead is much lower than sending to a landing page. Ross Andrew, CEO of Maropost commented that, “we are incredibly excited to be an early adopter of lead ads. Facebook is an important advertising vehicle for many of our customers. Lead ads will make it faster and simpler for companies to connect with people who want to learn more about their offerings, which is great news for marketers of all types. “We’re also excited that Facebook chose Maropost as one their initial launch partners for lead ads. We’re doing our part to revolutionize the digital marketing landscape and the integration with lead ads shows our commitment to that goal.” Facebook lead ads with Maropost integration are available today.